There are many ways in which an explosion can be prevented with the use of explosion protection equipment. When venting an explosion, a vent panel is used to act as a relief for the pressure build-up when an explosion occurs. If an explosion cannot be vented to a safe area, away from personnel and/or surrounding equipment, then a flameless explosion venting device can be used in place of a standard vent panel. See our blog post about venting to a safe area here. 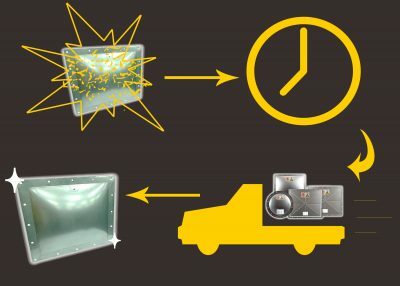 If an explosion vent panel bursts, it is important that a replacement vent panel is sourced and installed as quickly as possible to minimise downtime. We understand that production downtime can cause a lot of expense, whatever the reason may be for the interruption. We can identify with this issue and have worked hard to source a solution for this ever-frequent request. Euratex are happy to announce that we can now offer an emergency vent panel replacement service. This means that, in most cases, we can get a new vent panel to our customers in as little as 24 hours (subject to availability). By stocking the most popular sizes of vent panel at our warehouse in the UK, we aim to supply our UK customers with a new vent panel in fast succession. In our efforts to ensure that this situation is avoided before it arises, we have implemented a structure by which we provide our clients with a recommended spares list underlining the most important parts that should be kept on site, specific to each order. If our recommendations are followed, downtime will be greatly reduced should there be any disruptions to the process. If you wish to talk to us regarding your production process or would like to obtain your personalised recommended spare parts list, you can contact us via our web enquiry form or by telephone. Euratex are happy to offer any advice to our clients and can provide you with a prompt quote for an emergency vent panel replacement.